An evening with the Avery Review and ARPA Journal. In architecture, where research is everywhere and commentary comes easy, how does criticism and research speak to one another? Who are their publics and what are their modes of address? In a cabaret reading, ARPA Journal and the Avery Review reenacted the voices that animate two forums of spirited public conversation. In these acts, critics and subjects traded places, reading from and responding to the arguments and tactics of each other as a form of exchange. The Storefront community joined the journals’ editors and contributors Amale Andraos, Carson Chan, Andrés Jaque, Jennifer Leung, Leah Meisterlin, Elliot Montgomery, Garrett Ricciardi and Julian Rose for an evening of ventriloquism and reverie. 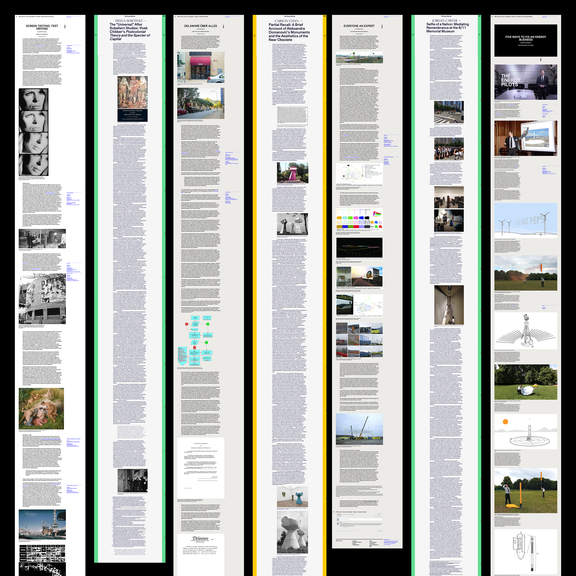 Avery Review and ARPA Journal are digital periodicals from the Graduate School of Architecture, Planning and Preservation at Columbia University. Through lively writing and engaged critique, both eschew the boundaries of academia and practice, and argue for the urgency of new platforms for thinking about architecture. ARPA Journal presents applied research to examine the ethical implications of research practice, and spark ideas for its potential transformation. The Avery Review explores the critical essay as potent form for testing one’s own intellectual commitments though an engagement with the work of others. Amale Andraos is the dean of Columbia University’s Graduate School of Architecture, Planning and Preservation, and a founding partner of WORKac. Her publications include 49 Cities, Above the Pavement, the Farm!, and the forthcoming Architecture and Representation: The Arab City. Jordan Carver is the 2014–2015 Banham Fellow at the University at Buffalo, a co-organizer of Who Builds Your Architecture? and an editor of the Avery Review. Carson Chan is an architecture writer and curator, pursuing a PhD in Architecture at Princeton University. He has curated many exhibitions of contemporary art and architecture, including the 4th Marrakech Biennial with Nadim Samman and the Biennial of the Americas 2013. His writing appears in books and periodicals worldwide, including Kaleidoscope, where he is a contributing editor, and 032c (Berlin), where he is editor-at-large. Jennifer W. Leung is co-founder and principal of LCD Studio based in Brooklyn, NY. She is a Critic at the Yale School of Architecture and an Adjunct Assistant Professor of Architecture at Columbia GSAPP. Ms. Leung was the 2006–2007 Architecture and Urban Studies Fellow at the Whitney Museum and a 2012 MacDowell Colony Fellow. She received an M.Arch I from Princeton University and a B.S. from UCLA. Leah Meisterlin is an urbanist, architect, and planner; a geosocial data scientist, geographic information systems specialist, and cartographer. Currently, she is a Partner at an interdisciplinary architecture practice Intersticity, term assistant professor of architecture at Barnard & Columbia, and Research Director at Special Project Office (SPO). Her research is primarily focused on concurrent issues of spatial justice, informational ethics, and the effects of infrastructural networks on the construction of social and political space. Elliott P. Montgomery uses speculative design methods to probe social and environmental implications of emerging technological scenarios. He currently teaches design strategies at Parsons, The New School for Design and has practiced as a design consultant for clients such as Autodesk, GE, LG, Honeywell, and the NYC Department of Education. His work has been exhibited at institutions around the world, including the Museum of Art and Design, the Shanghai Powerstation of Art, the Cite du Design International Biennale, and The Storefront for Art and Architecture. Montgomery is a former design research resident at the US Department of Energy’s ARPA-E, a Core77 Design Award Winner, and an Andrew Carnegie Scholar. Garrett Ricciardi grew up in New Jersey. He received his Masters of Architecture from Princeton University where he was awarded the Suzanne Kolarik Underwood Prize for Excellence in Design. Before studying at Princeton, he attended the Whitney Museum of American Art’s Independent Study program, and received his BFA from Cooper Union. He has worked for Acconci Studio, Stan Allen Architect, and Steven Holl Architects. Ricciardi’s art and design work has been exhibited internationally in numerous galleries and museums including The Sculpture Center, MIT List Visual Art Center, The Center for Book Arts, and Artist’s Space. In addition, he has received grants from the Foundation for the Contemporary Arts and the Bose Audio Corporation. Julian Rose grew up in Colorado and New York City. He received his Masters of Architecture from Princeton University where he was awarded the School of Architecture History and Theory Prize. Prior to attending Princeton he earned his BA from Harvard University in Art and Architectural History. He has worked for AMO on Rem Koolhaas’s proposal for the State Hermitage Museum in Saint Petersburg, Russia, and for the American firm LTL Architects on various buildings, installations, and exhibition designs, including projects sited at Lincoln Center and the Architectural League of New York. Rose’s writing on both art and architecture has been published internationally in such publications as Domus, Log, and Artforum. Caitlin Blanchfield is a writer and researcher who lives in New York. She is Managing Editor in the Office of Publications at Columbia University GSAPP and an editor of the Avery Review, her writing has appeared in Pidgin, San Rocco, Urban Omnibus, and elsewhere. James Graham is the Director of Publications at Columbia University GSAPP, where he is also teaching and pursuing his PhD in architectural history. He is the founding editor of the Avery Review, and his own writing has been published in Grey Room, AA Files, Manifest, and other journals. Isabelle Kirkham-Lewitt is a Master of Architecture candidate at Columbia University GSAPP and received her B.A. in Art History and Architectural Studies from Brown University. She is also co-founder and co-editor of : (Colon) Publication. Troy Conrad Therrien is a partner in Therrien–Barley, a design and innovation consultancy, and a faculty member at the Columbia University GSAPP where he co-directs the Architecture Online Lab and directs The Energy Issue initiative. He holds an MA in architecture history and theory from the AA, an MArch from Columbia and a BASc. in computer engineering from the University of British Columbia.